Granular bentonite materials are some types of buffer/backfill materials with good performance, which are constituted by bentonite pellets or by pellets and bentonite powder. The dry density is the key parameter which controls the engineering properties of buffer/backfill materials. The grain size distribution will influence compressibility and dry density of the compressed granular bentonite materials. In the present work, four types of granular bentonite materials and bentonite powder had been selected and the compressibility and the degree of compaction of these packing materials had been studied. The results showed that the granular bentonite material contains 30% (in weight) powder and 70% (in weight) pellets sized between 2 and 5 mm had the best cost performance, such as, higher dry density, higher compacted dry density, easy to produce. 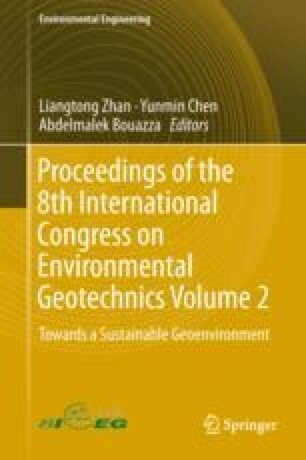 The authors want to acknowledge the financial support provided by Project 41672261 supported by National Natural Science Foundation of China and the financial support provided by Project 2007-834 supported by the State Administration of Science, Technology and Industry for National Defence, PRC.